Wind power, having enjoyed a fortunate existence largely immune from market forces, is finding life in the real world a rough go. The Bonneville Power Administration announced last month that it would curtail Northwest wind production to help manage runoff from the largest snowpack in 14 years. The move was an attempt to preserve enough capacity on the power grid to handle the electricity generated at the region's hydroelectric dams. BPA pulled the trigger on its plan for the first time May 18. Since then, conditions have forced the curtailment of approximately 10 percent of the power wind producers would have otherwise generated. Wind was the agency's option of last resort. With the region's only nuclear power plant already offline for a scheduled refueling, and BPA having already limited production at coal and natural gas plants, wind was the last non-hydro source standing. That didn't silence the howls of wind farm owners, nor did the offer to replace lost generation with free hydro power. Northwest wind farms are as much in the business of selling power as they are in the business of collecting tax credits - and when the turbines aren't pumping out power, they aren't collecting. The wind industry says it's lost millions by being temporarily cut off from the federal transmission system. And it wants BPA - read: Northwest ratepayers - to compensate wind producers. BPA has declined, and the argument is likely headed to court. 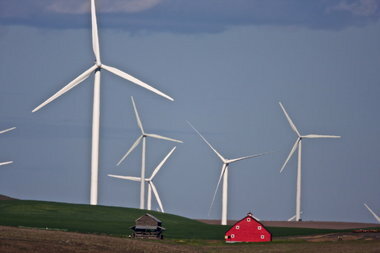 The controversy should prompt a fresh look at what's driving the proliferation of wind farms dotting Eastern Washington and Oregon - farms that are capable of producing as much power as three nuclear power plants and are projected to double their generation in the next four years. The driver isn't need. The Northwest has plenty of power - too much power, even - and most of it is already bona fide renewable. Wind power is here because state mandates force utilities to buy power they don't need and the federal government subsidizes producers' bottom lines. False incentives that encourage wind producers to keep building will exacerbate the region's glut of power production. One way or another, Northwest utility customers will pay the price.